I recently completed one of those silly quizzes on Facebook which showed you where your favourite places to visit are; mine returned the National Theatre, the Old Vic, Regent’s Park Open Air Theatre, and Brixton Academy. Clearly both my theatre going and gig going are noticeable to the bots! I often go out straight from work and with an hours journey from the West End to home there is always a need to find somewhere to eat pre-theatre. It sounds simple, but if you like your food a little refined but that can be delivered within a non-negotiable time-scale, it can be a little tricky to get it just right. So I was thrilled to be asked to try out the new pre-theatre menu at STK in the heart of theatre land on the Strand/corner of the Aldwych. It’s inside the ME hotel, but has a separate entrance. We stepped into a very glamorous interior indeed! Whilst sipping a beautifully chilled glass of fizz, we were brought complimentary bread drizzled with blue cheese and served with a chive dip. My companion is allergic to cheese (something that would be unbearable for me! ), and once she said that, it was no problem at all for her to be brought an alternative. With that sorted, we chose from the pre-theatre menu. 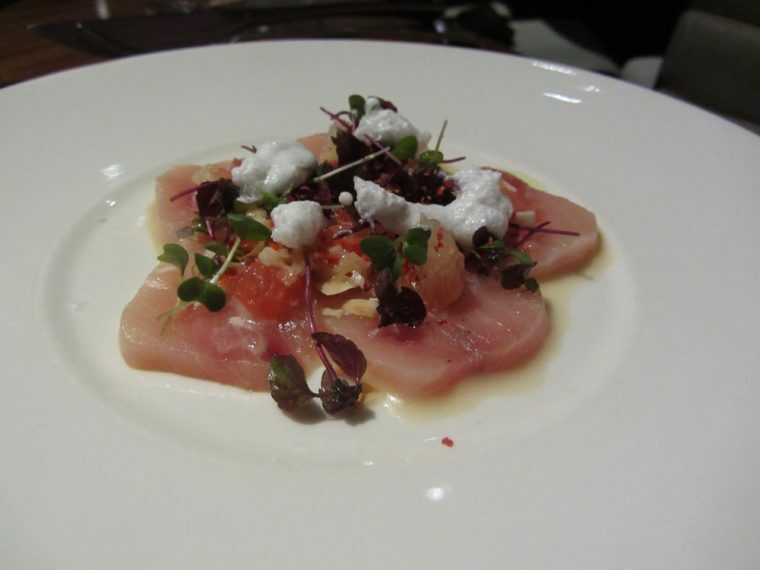 The choices are from a fixed menu, as you would expect, and offered a vegetarian option, a fish option, and a meat option for the starter and main courses. In the interests of research we opted for the fish and meat choices from each course and shared. 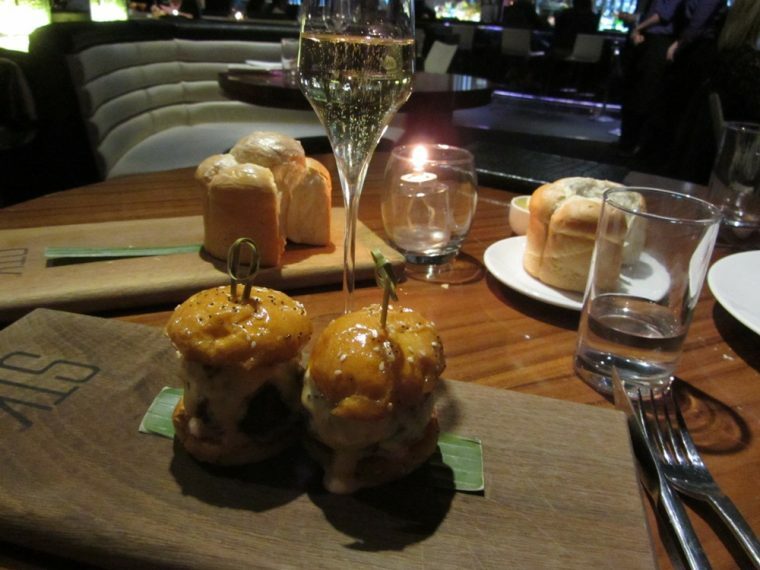 Our starters were a ceviche of swordfish and 2 mini wagu burgers with a hint of truffle oil. We both loved the ceviche, which was a lot less citrusy than many I’ve had, with the fish so tender it melted in the mouth. Whilst tasty, the wagu mini burgers were frankly a meal in themselves! Our mains arrived, and were both prettily plated and beautifully cooked. 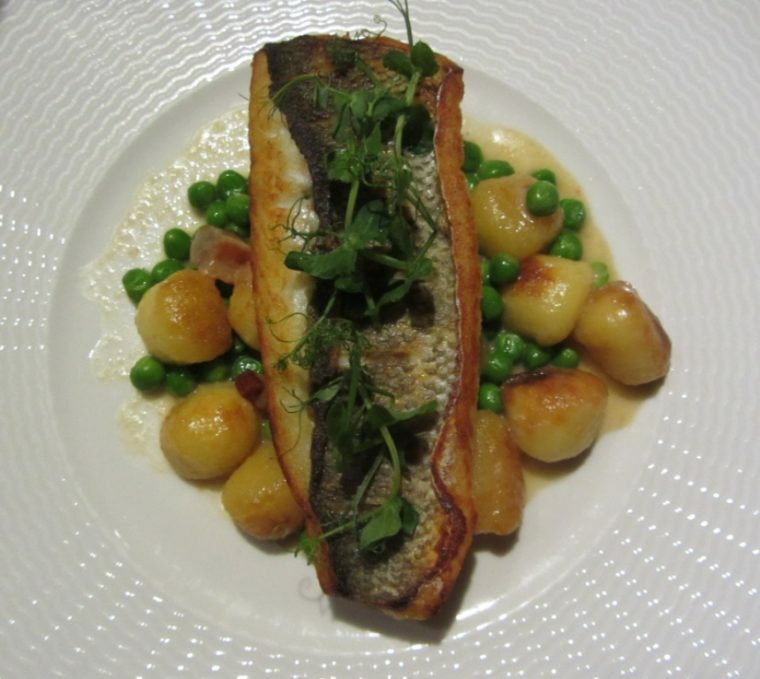 We ordered pan-fried sea-bass served with gnocchi, and chicken served with an apple dumpling and a slice of black pudding. Our vegetable choices were either mashed potato or French fries; so we ordered one of each. 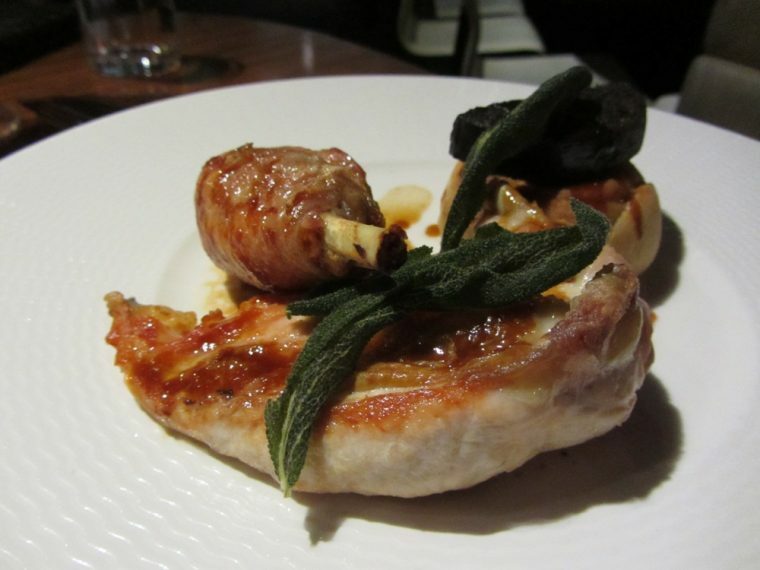 Both were very generous portions, and the mash would have made James Martin proud – it was full of butter! As we weren’t actually going to the theatre on this occasion, we begged for a pause before our dessert. 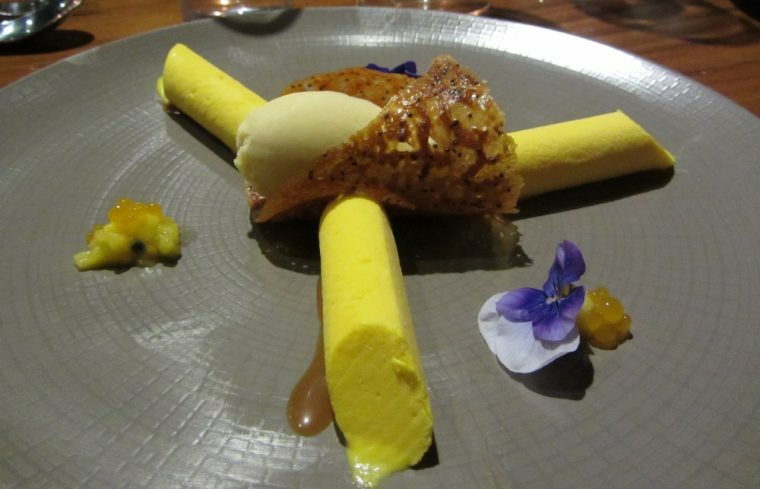 This time we opted for the same option of mango sorbet and ice cream, this was utterly delicious. The other option was a sticky toffee pudding. 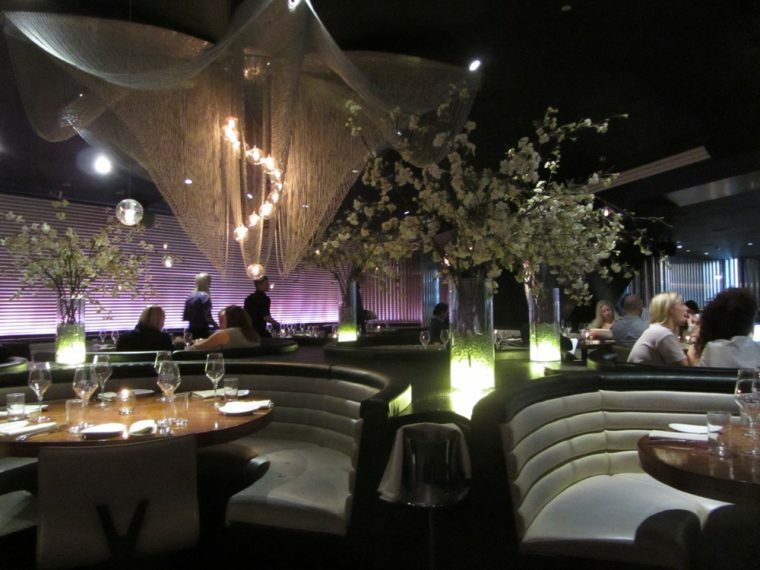 We left STK feeling very full! I’m not sure that if I’d eaten that amount before a play that I’d be able to stay awake during the production! The pre-theatre meal costs £30 for the 3 courses. We were guests of STK. What a bargain for an incredible meal. The choices sound (and look) great and it sounds like everything tasted wonderful.